ASUKALA GPS Sun Shade, GPS Navigator lens hood Visor Anti Reflective for 7-Inch Portable Bluetooth Vehicle GPS by ASUKALA at iShare Maps. MPN: 43307-5305. Hurry! Limited time offer. Offer valid only while supplies last. Specifications: : Gasket ensures easy install/remove from all GPS unit. It will reduce glare and reflections for better contrast and visibility. Gasket ensures easy install/remove from all GPS unit. Kindly note that it may not meant to fit to the edges of the unit, but just around the screen. 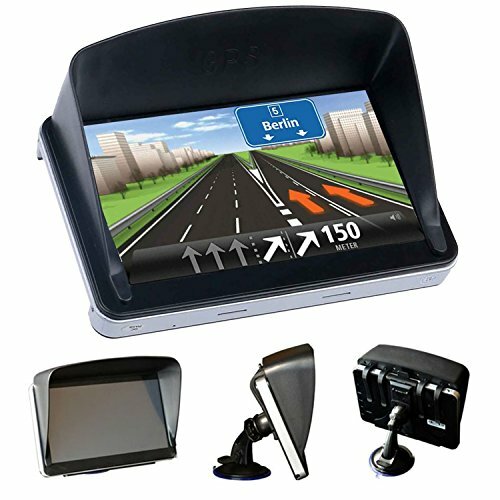 2、7-inch navigator sun shield, help you solve the problem, for example under a bright light the GPS navigation reflective, can not see clearly. 3、Make your driving easy, no longer worry about not to see the navigator route. 4. It can be reduced to 300 lumens of light, the navigator can still clearly in bright light, not reflective. 5. It Can be used in the 7 inch GPS and similar navigator. 6. Easy to install, easy to disassemble, solid and reliable . 7. Toxic and tasteless, can be recycled, in line with international environmental protection standards . 8. It does not affect the reception of the satellite signal . If you have any questions about this product by ASUKALA, contact us by completing and submitting the form below. If you are looking for a specif part number, please include it with your message.